There is no doubt about it, conditions are changing for the better along the coast and the fishing is already showing signs of improvement. Early season barracuda schools are showing up on the beach above Ventura with some giant white seabass in the mix; like the two fifty-pound class fish that Captain Larry Heron on the Calico Hunter (http://calicohuntercharters.com) caught during a coastal charter last weekend. Boats fishing the Channel Islands are also scoring seabass. And while this bite is happening a little too far north for most of us to take advantage of, the early season influx of barracuda in those waters has historically been the harbinger of a good fishing year. 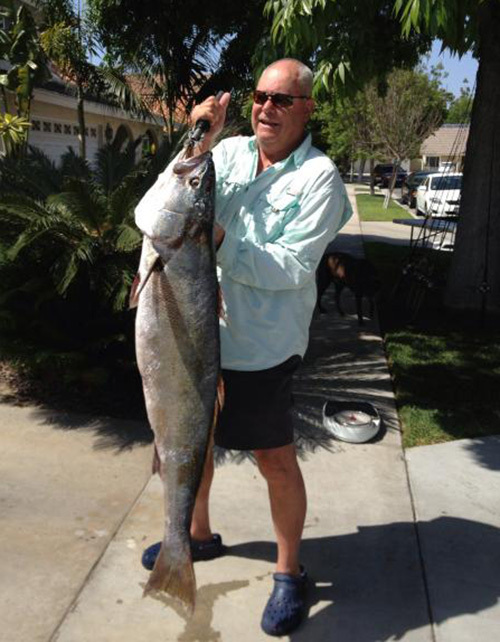 If this pattern plays out like other years with the early season barracuda showing up in Ventura, the fish should pop up next in the San Diego half-day counts. Next they should be under bird schools in the Santa Monica Bay and finally along the beach from Long Beach to Orange County. 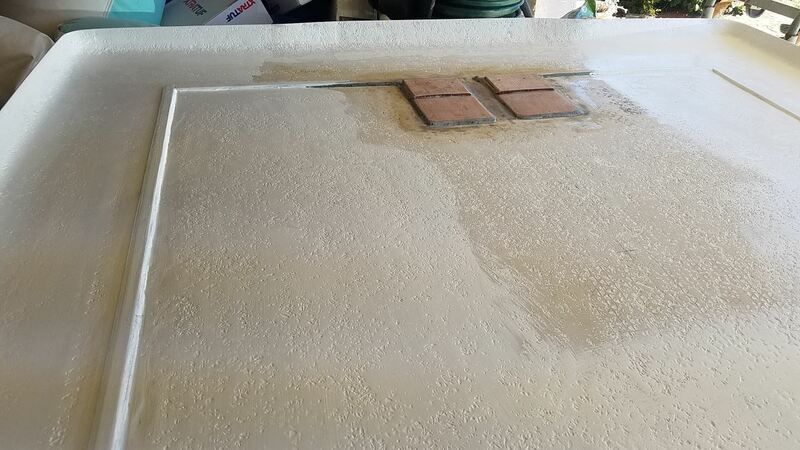 Of course all of those things are subject to water conditions and the movements of bait schools. So it will be interesting to see how it all shakes out. I understand that tracking the seasonal movements of the barracuda schools isn’t of interest to a lot of fishermen, but with the amount of jumbo seabass that have been mixed in with the barracuda schools over the last few years, it’s definitely something worth keeping an eye on. 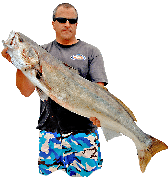 You don’t need the barracuda to be biting to catch early season seabass, like Lal Parsonage proved with the 47-pound fish he caught while targeting sand bass over the weekend, but if you find good barracuda conditions, they’ll be the same conditions that you would want for early season seabass. I don’t pretend to be an authority on seabass fishing, so I’m not going to go into any details about my theories on catching them as they are simply “theories” and nothing more. 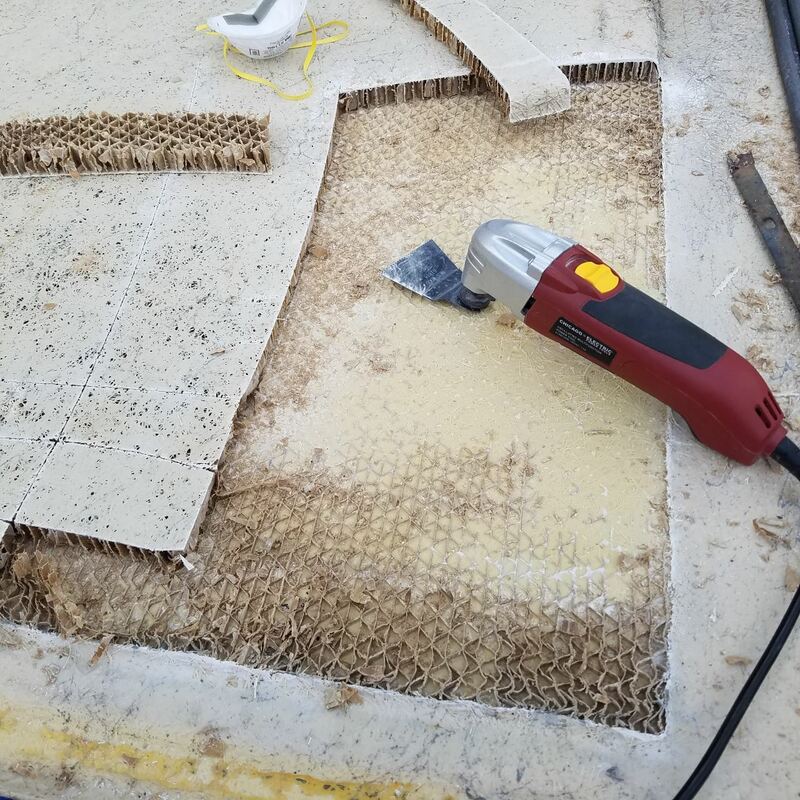 But I will say that all of the seabass by-catch I’ve had while targeting sand bass on my boat over the last few years has fallen into a very specific pattern. 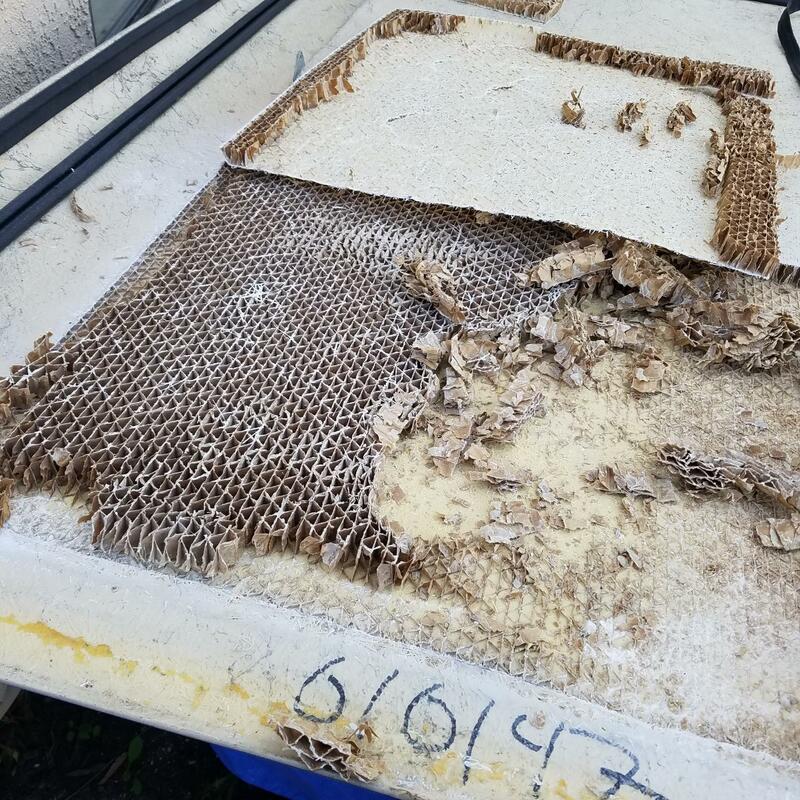 All of those bites came off meter marks that I found while driving through areas that had big schools of fin bait, with active birds and seals or dolphin working in the immediate vicinity. Like I said, I’m not an expert; but at this time year it’s pretty easy to find conditions that are conducive to both barracuda and seabass bird school fishing. 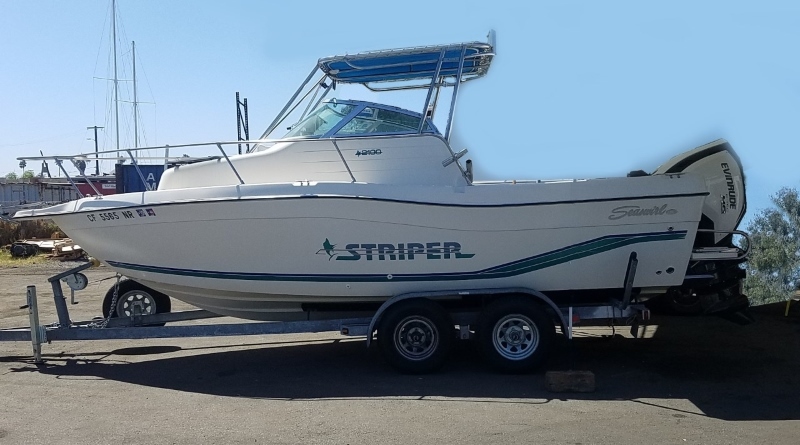 So once the barracuda show up in an area that you like to fish it might be worth investing in a couple of days driving around and looking for the seabass that are likely to be in the area as well. Speaking of days spent driving around and looking for something, that is exactly what I’ve spent the last three weekends doing. 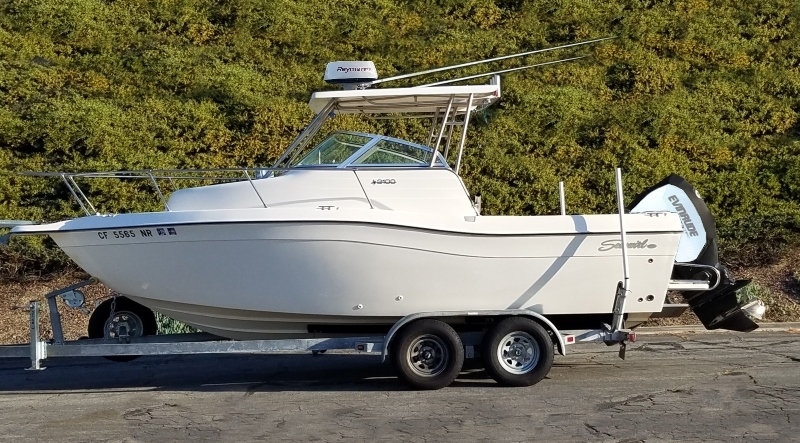 But instead of looking for big seabass, I’ve been desperately trying to find three-pound or better calicos and sand bass off the coast of Dana Point. And while catching a three-pound fish may not sound all that challenging, I can attest to the fact that over the last few weeks it’s been damned near impossible. Sure, there’s been plenty of fish in the one to two pound range and more than a few in the mid to high twos, but I’ve only caught a couple of three pounders during that time. What’s so important about catching three pounders? 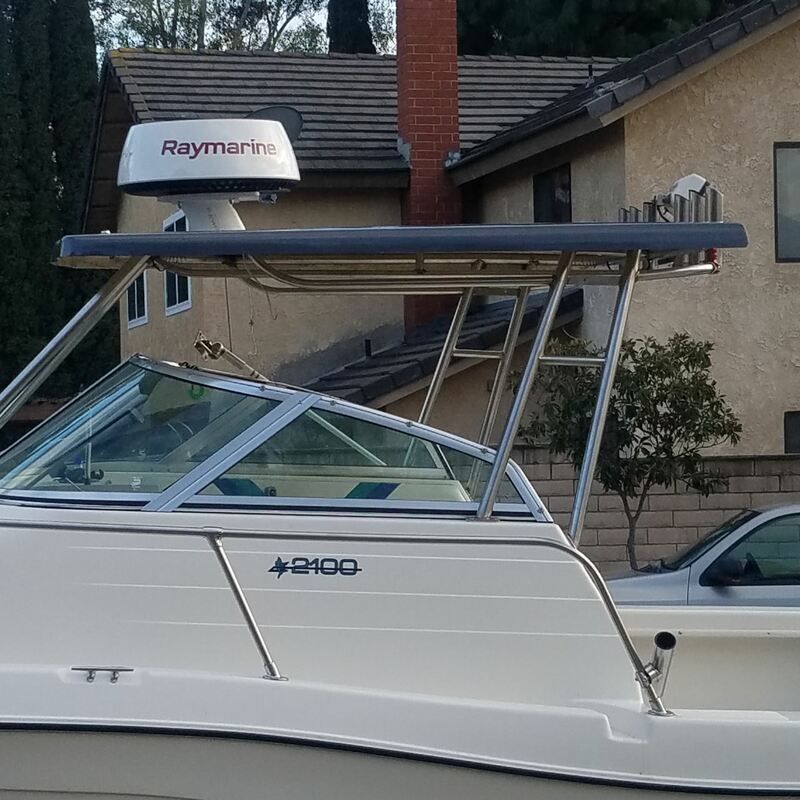 Well in next week’s SWBA tournament that will be hosted in Dana Point, catching five bass over three pounds is going to translate into a top finish, a trip to the stage and a payday; while catching five two pound fish is most likely going to result in a lackluster and middle of the pack finish. 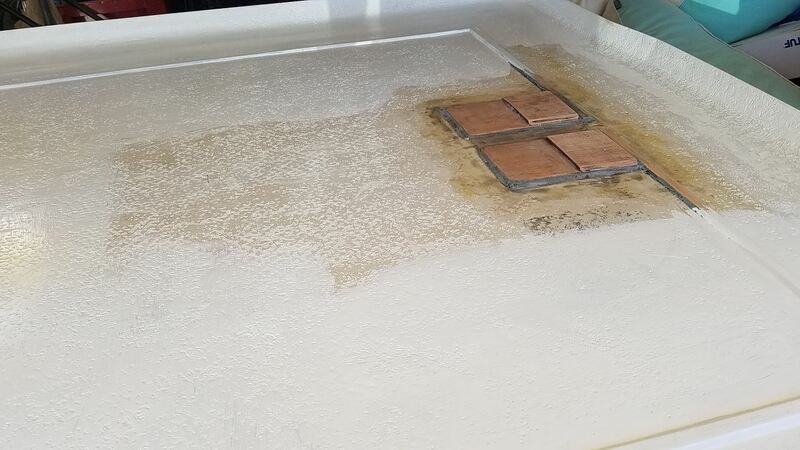 But with water conditions warming and stabilizing, I’ve got high hopes that we’ll find at least a few of those right bites on tournament day. 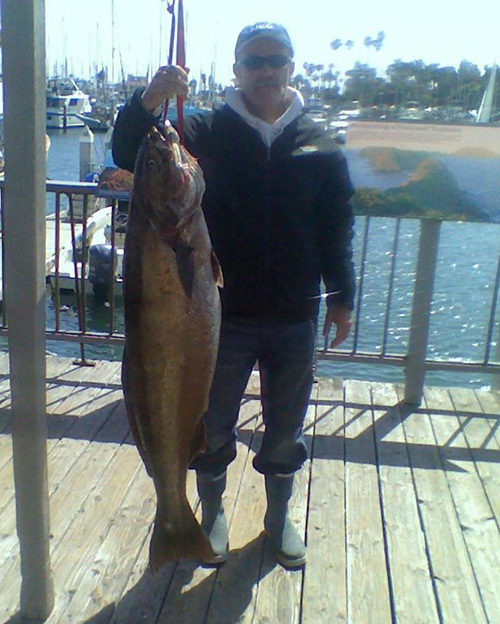 I started using a new Smart Phone App called Fish Alerts (http://fishalerts.com/) while I was pre-fishing Dana Point this last month and it’s been extremely helpful. The App has a bunch of features on it, but the two that I use are the chart that shows the MPA’s and my exact relation to them and the tide log. 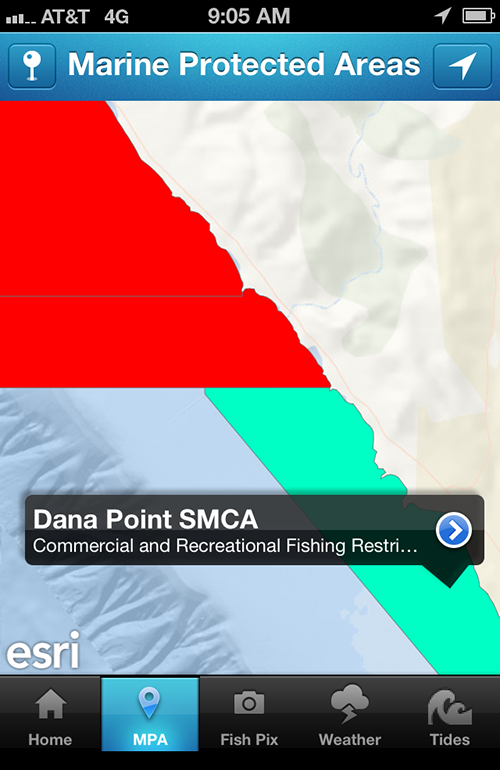 The MPA map uses your phone’s GPS to plot your exact location in relation to the MPA, which is really handy because the borders of most MPAs are not easy to eyeball. 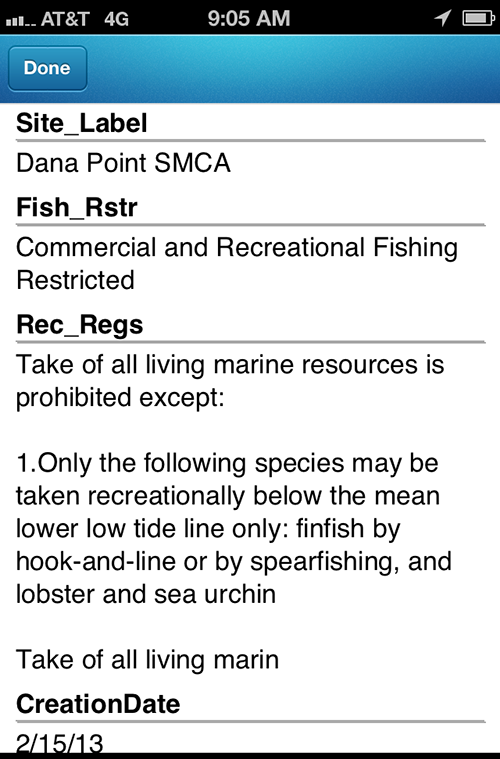 And if you’re fishing in a new area, you can click on the MPA and it will give you a description of what is or isn’t allowed within the boundaries. 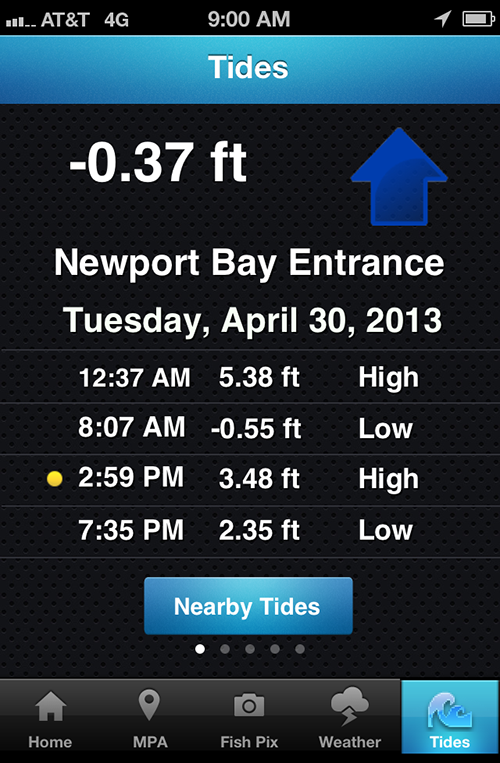 The other feature I like is the tide chart, as it not only gives you the tide tables, but tells you the exact point of the tide that you’re fishing at any given moment. This is very helpful when pre-fishing because it allows me to keep track of what the tide is doing when I find biting fish. For example, if I’m fishing a shallow beach and the fish bite for an hour during a minus tide, I can go back to that area again on a future trip and see if I can recreate that bite during a similar tidal period. 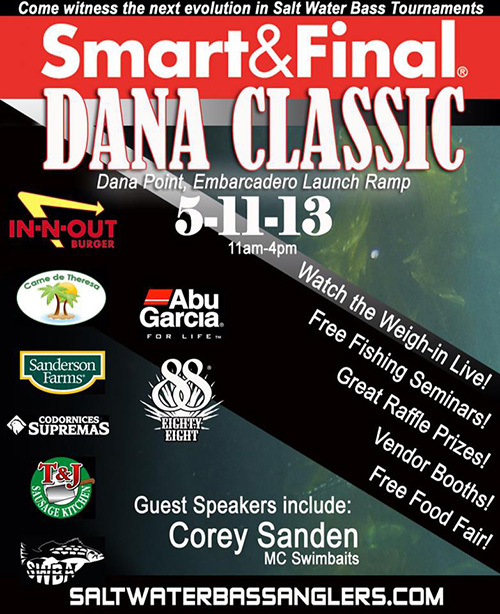 If you’re interested in learning more about inshore bass fishing or are just looking for something fun to do with the family on a Saturday afternoon, you should come down to the SWBA Dana Point event on May 11th. From 11:00 AM – 4:00 PM, the SWBA, along with their title sponsor Smart and Final, will be hosting a free food fair (offering lot’s of BBQ food and the In N Out Burger truck). There will also be tackle vendors, a raffle and a seminar by Corey Sanden of MC Swimbaits. The tournament weigh-in will be shown live on a big screen TV and the awards will follow on the main stage. Aside from being a fun (and free) way to spend a Saturday afternoon, this event will be a great opportunity to check out the boats and gear that the guys fishing the series are using to target saltwater bass. So, whether you’re interested in learning more about inshore fishing or are thinking about buying a boat of your own, come on down and talk to the guys that are fishing the series, they’ll be more than happy to answer your questions and show off their rigs. And if I can manage to figure out where those three-pound plus bass are hiding on tournament day, you might even see a rare smile on my face at the awards.